Open to artists in all media. This is a two-instructor workshop for artists wanting to make advancements in their techniques and strategies. Casey and Ken will have ample time to give very focused attention to individuals and offer a number of provoking ideas to the group. Also, Ken will present simple Photoshop techniques for taking your works to the next level and creating better pathways for finishing your artworks. You will be given a Photoshop instruction guide and have access to Ken's personal photo file of over 1500 inspiring images by various artists. "Thank you so much for the wonderful, thought compelling workshop. You rekindled my love for making art. Your enthusiasm is contagious and felt throughout the room. You set up a stimulating environment that provided continuous visual images. Your generosity in sharing your own photos was much appreciated. I found you to be humorous, supportive and kind. I would recommend you as an instructor to anyone who would like to take their art to the next level." "Yours was exactly the kind of workshop I had hoped it would be to give me the focus I needed. I can't thank you enough for coming all this way for such a small group...but I think you got the students who needed you the most! "The Workshop was amazing. It made me get out of my way in terms of a different painting method and expanded my vision. Also, the friends I made from that weekend are wonderful. My eyes were opened and I can't go backward from that." "Thank you for sharing all your stories. I think you have a great way of helping people grasp and put into practice the principles of manifesting. Cheers!" "Thank you so much for lighting up our lives and our paintings at this past weekend’s workshop! I loved hearing about your time with Wolf Kahn, your thoughts on painting, the beautiful demo, and of course the great feedback you provided us on our own paintings. You really reignited my desire to paint freely. I hope to spend another weekend painting with you sometime soon." "Thank you for our workshop! It was a great two days. You are an amazing host and instructor, (two things that don’t always work together). You pulled something from each of us and it was wonderful to be a part of it. Thanks to the moon and back." "So, when my friend, Ken Elliott, told me he was co-teaching a workshop on color with Casey Klahn, I immediately said sign me up! 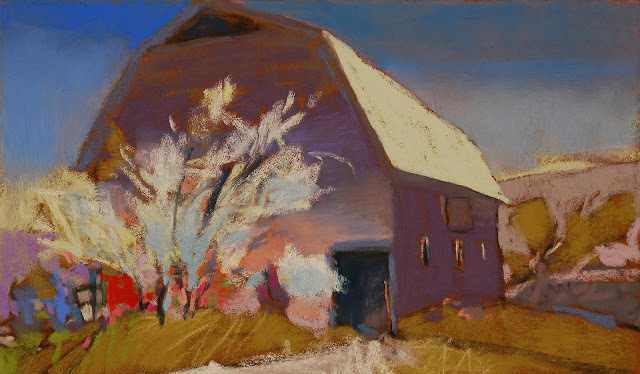 Ken's work is simplified impressionist landscape with an emphasis on bold color like reds and yellows. 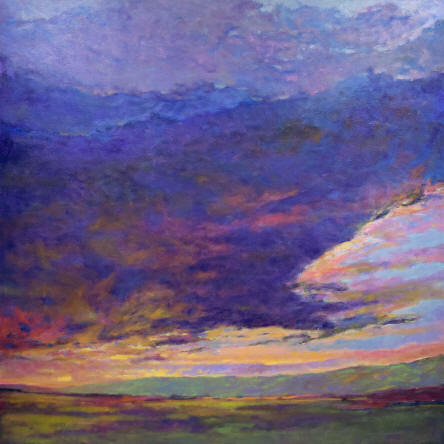 Casey's work is influenced by the cloudy days of the northwestern part of the United States, and his paintings are simplified, abstracted landscapes. Casey uses subdued colors like blues and purples. 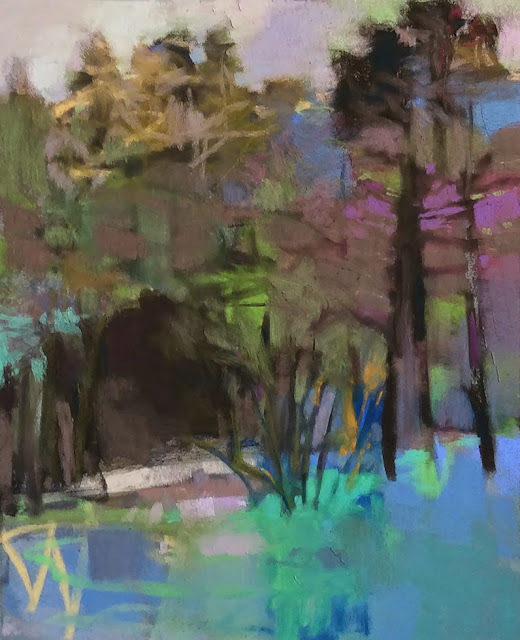 Both artists' style and color sense are so dramatically different than mine that I knew I would be challenged by this workshop. And indeed I was! I have to smile when I see the work I produced in this workshop. It's so unlike my usual work." I so enjoyed meeting you and being part of the workshop. You got me on fire!!!!! "Wow! My weekend of private lessons was fabulous! While I was there I stepped into a whole new world that my soul was calling for. Wonderful conversations, a beautiful time with great art everywhere and artistic success!" "Thank you so much for including me in the wonderful weekend workshop at the Castle Rock Artist "Retreat" :D I found all of you to be a delight and am so happy to meet each of you! Ken, you are a wonderful teacher & inspiring person!! The one day with you in your B-E-A-U-T-I-F-U-L home & "artist sanctuary" was "exactly" what I needed on so many levels !!! Thank you for your generosity, great color sense, sharing of your artful knowledge & supply resources. I came away with a renewed art spirit and also w/ some new artistic ideas for applying paint to the canvas! Very inspiring indeed! "When I signed up for a painting workshop, who knew that it would be so much more. Thank you Ken. For your kindness, generosity of spirit, and sharing your knowledge and skill of painting with us. And thank you to everyone for making our time together a magical weekend which will be cherished. Fortunately the universe provided me with what I needed, whether I knew it or not." "Your workshop changed my whole outlook on what I might be able to do with my art career and gave me the confidence to really go for it. It was also huge from a creative standpoint, helping me focus on color and having that be the lead/primary solution to my paintings as a colorist and abstract artist - but also from the manifesting angle it was my introduction to the whole idea and what set me on my course as a professional artist." "Just wanted to thank you again for a very inspiring, informative, and fun workshop. I worked LARGE today! "Hey, I DEFINITELY recommend this! SIGN UP for Ken's class! Take your art further than it's ever been!" "You are a wonderful, vibrant instructor!" "You are so gracious. Thank you so much for the wonderful workshop and ALL that you shared. It was a great weekend." "Great class Ken! Thank you for all the good tips and inspiration. So glad you came to Houston." A good time was had by all! Thank you! "Thank you Ken for a awesome workshop, picked up some new tools to advance forward. Looking forward to using them tools. I had a great time meeting everyone and working together." I started this oil while I was doing private lessons. 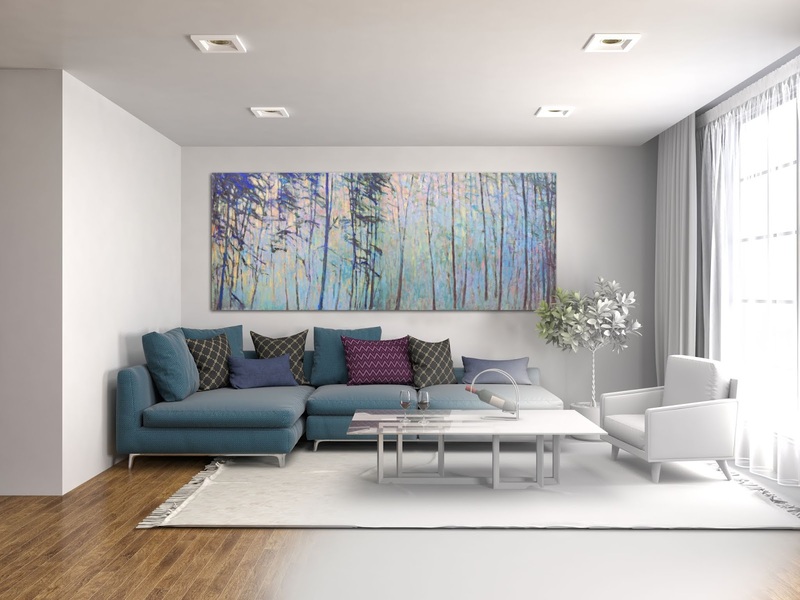 The idea being presented was to grey down all of the colors and create a sunlit piece without the need for saturated colors and bright effects. Parts of the painting still appear to be bright but it's a nice illusion. The brighter colors are in reserve - they are not used here, but more vibrancy could have been brought in if needed. 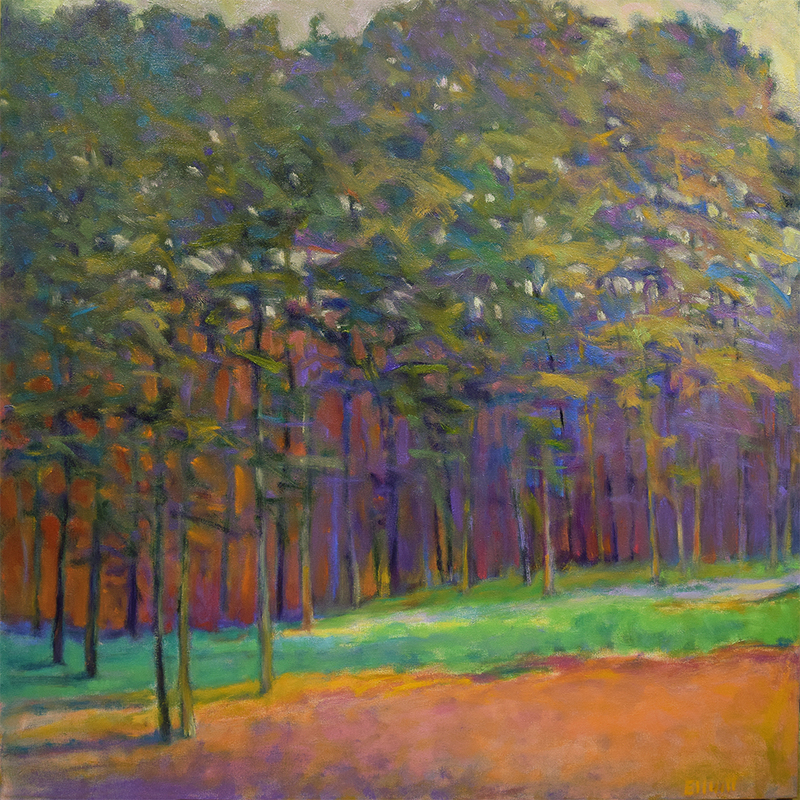 Since the colors are not a full strength, it allows for the delicate purples and blue-greens to play a prominent role here and there, breaking up the line of trees and making this part of the forest more interesting. It's a good strategy for making every color count and creating a softer mood. The composition went through numerous changes, simplifying each time with the end result being a painting equally focused on color and composition. My thanks to the collectors that purchased this work. It's always an honor. Article and Video: Did a Deceased Couple Steal a de Kooning and Get Away With It? Here's a very interesting headline from the Washington Post, August 3, 2018 by Antonia Farzan. This is an excerpt, so check out the full Washington Post story here and scroll down to see the video documentary. Woman-Ochre” by Willem de Kooning.